Have you ever thought what piece of music you would like others to hear at your funeral? The music choices of the funeral services are the object of study in Anne-Marie Grundstén’s dissertation Funeral music and how it is selected in Finnish-speaking parishes of the Evangelical-Lutheran Church of Finland. Grundstén explores the way the music is selected in the funeral services and especially what is the role of church musicians in both planning and executing the service. Grundstén, being a church musician herself, mentions in her foreword that she wished to emphasise their viewpoint and experience and how the musicians working in the church view the funeral services as a part of their occupation. Grundstén’s dissertation deals widely with the selection, execution and meaning of funeral music, and one of the themes is the disagreements between the parish employees and the family members. Since the funeral service should be regarded as worship, there are certain limitations on the subjects of the music performed there. In the questionnaire that was conducted for the source material of the thesis majority of the church musicians stated that the music performed in the funeral service should be limited in music pieces that have spiritual substance in them. This said, many musicians had the experience that many Finns are estranged from the overall worship life of the church and thus they might not have a very clear idea of what is appropriate when making requests for the music in the service. This was reported to be a source of conflict in the preparation of the service. However, in the study it turned out that mostly these cases could be settled without further problems, as the church musicians generally felt that their role is to serve the parish members and in many cases the “problematic” music pieces could be moved to the memorial service held after the funeral. Interestingly, in Grundstén’s study the burials of veterans that had served in the Finno-Russian wars appear to be cases where were notable differences between the parish policies on the music. Grundstén reports that musical pieces like the composition Narvan Marssi (The March of Narva) and the song Veteraanin iltahuuto (The Evening Call of a War Veteran) were sometimes used in the funeral service of veterans, as it was generally felt important that the events of their life should be commemorated. However, there were also church musicians who felt that these pieces of music were unsuitable for a church service and thus should be played in the subsequent memorial service instead. While generally the participants of the study thought that the funeral music should hold theological themes, the music related to veterans and patriotic values seemed to be something of a borderline case: some viewed them appropriate for the church context, other stated that warfare was not a subject suitable for worship. Grundstén’s dissertation reveals that church musicians feel confident about their expertise on the field of spiritual music and its role in the funeral service. On the other hand, many of them reported that were not able to partake to the funeral arrangements as much as they wished. Regarding this matter, she also studied the conflicts between parish employees, particularly the church musicians and the clergy. Some musicians expressed dissatisfaction in certain cases, for example referring to a situations where they were not consulted when selecting the music and thus ending up with music choices that were not appropriate for the situation. In a similar manner, the disagreements over suitability in the church context were referred in the study answers several times. Some church musicians felt that the clergy had the habit of defending pieces that had been deemed inappropriate by the musician. Generally the concept of “spiritual music” is flexible, and church musicians are required to seek balance between the music themes, the personal feelings of the people involved and other circumstances related to the occasion. This said, diplomacy is a skill that comes in handy for church musicians. Overall Grundstén’s study gives us a good, versatile picture of the experience of church musicians as a part of funeral services. She points out that church musicians are often involved in the funeral starting from the planning and preparation through the burial rites to the memorial service, and the work can easily be intensive, given the heavy feelings of the family members. Anyhow, many musicians wished to be even more involved in the musical arrangements of the funeral as professionals of religious music. The importantance of funeral music stands out from the study findings. Many of the participants in her study felt funerals to be among their most important tasks, for some even the most important. This seems understandable, as funerals held in church buildings are popular even among people who are not part of the Church of Finland anymore. The music holds an influential role as a source of consolation and as a form of prayer, and a important part of the church musician’s expertise is to understand the value of music as a both secular art and a transcending, spiritual device. This entry was posted in Yleinen on 15.2.2018 by Sara A Jormakka. For many Finns, Christmas songs are all about singing together. The Finnish tradition of public sing-along events called The Most Beautiful Christmas Songs (MBCS) was started at the third Advent Sunday in the year 1973. During this time that particular Sunday attracted very few church-goers, and the idea of singing Christmas songs together was an experiment to activate people to visit churches. Perhaps surprisingly, this is what the Finnish people have indeed done! 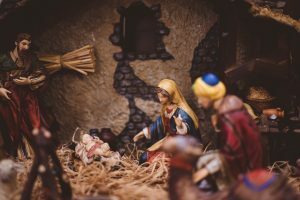 According to a survey made by the Research Center of the Church of Finland, every parish of the Lutheran Church of Finland arranges these public sing-along events each year between the first Advent and the Epiphany. And again in 2017 the weekend of the third Advent Sunday has been the most important time to sing Christmas songs together. During these forty-four years, MBCS has grown into a large-scale phenomenon: a local parish can arrange up to dozen of MBCS events each year, not only in the church buildings but for example in garrisons, prisons, workplaces, trains, and restaurants as well. Every year the missionary organization Felm publishes a special song booklet for the event, comprising around 25 beloved Christmas songs. Currently, some 500 000 – 1 000 000 Finnish participants, out of the 5.5 million Finns, attend to MBCS events each year. Out of these people many are young adults who otherwise very rarely go to church in Finland. Her statement appears to be very incisive! Most of the songs sung in the studied MBCS event were composed to a minor melody. Furthermore, this is the case with many other favourite Finnish Christmas songs as well. Interestingly enough, death, loss, and sorrow were frequently mentioned in the answers of the study. This phenomenon has something to do with the family-centered way of celebrating Christmas, which, in turn, can be seen in the popular habit of visiting cemeteries and the graves of deceased family members during Christmas Eve. On the other hand singing familiar songs, especially together in a crowded church hall, has the power to recall the old memories and emotions. While these themes were important for the singers, none of the 12 songs that were sung at the event mentioned death directly. However, the song Varpunen jouluaamuna, or The Sparrow on a Christmas Morning in English, implies death indirectly in its lyrics. The song were written in 1859 originally in Swedish by the Finnish writer Zacharias Topelius. The fact that this very song was in 2016 voted to be most beautiful of the Finnish Christmas songs tells us something very special about the feelings connected to the Finnish celebration of Christmas! järvenaalto jäätynyt talvipakkasessa. In the valley fell the snow, over trees and flowers. Frozen waters’ vernal flow, summer gone for sowers. Sparrow little, come to me, take a morsel, starveling! Gladly take I grain from you, morsel from your platter. 4. En mä ole, lapseni, lintu tästä maasta. pieni sai sun veljesi enkeleitten maasta. A stranger am I not to you, though from far away. I’m your little brother who passed away a spring day. you gave it to your brother who passed away a spring day. The lyrics paint an image of a very typical and traditional Finnish countryside in wintertime: a lowly house beside a lake, perhaps a small field on the side of a valley surrounded by forest; a lot of snow, cold weather, and only a few hours of daylight. As it is Christmas time, the poor girl gives her present to a sparrow, one of the few small birds we can see flying around even during the cold Finnish winter. Unexpectedly it turns out that the sparrow is her late little brother, who, after his death, now comes in the form of a bird to visit his sister. The minor key music, composed by Otto Kotilainen and published in 1913, emphasises the wistful mood of the lyrics. To conclude this post, it is still worth mentioning that there are some other kind of Finnish Christmas songs as well. Tulkoon joulu or Let there be Christmas is also one of the most popular songs used in The Most Beautiful Christmas Songs events, as well as in Heavy Christmas concerts. Now there is a melody in a major key, which goes well along with the wishes of joy and peace! taakse jo jäänyt, on syksyn lohduttomuus. let there be peace endless. somewhere a mother, is swaddling their children to a crib. Then there will be Christmas with us. tuo ensi joulu sai muuttaa historian. that this first Christmas would change the history. löydät vain seimen ja tallin koruttoman. open your heart and you will meet the Redeemer. you’ll only find a crib and a stall so simple. This entry was posted in Yleinen on 21.12.2017 by Sara A Jormakka. Gree tings everyone! I’m Sara Jormakka, a theology student from the University of Helsinki. Currently I’m doing my internship for my Bachelor’s degree and I’ll be taking charge of this site for a while. Despite being still a BA student I have already completed my Master’s thesis in the hymnology seminar led by Tapani Innanen, and in this post I intend to tell a bit more about the subject of my thesis. While I was studying in a Catholic university in Ireland, I noticed that they started their mass with a prayer for the Virgin Mary. 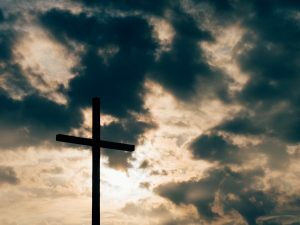 The familiarity Catholics feel towards the mother of Jesus is indeed not a surprising discovery – in fact, sometimes Protestants tend to exaggerate it quite a bit. While some attempts to understand the similarities and differences between the Lutheran and Catholic understanding of Mary have been made before, I noticed myself being curious about what hymns have to say about the matter: how do Finnish-language Catholic and Lutheran hymns describe the Virgin Mary? I was able to make my research that possesses a strong ecumenical flavour on a rather remarkable year, the 500th anniversary of the Reformation. My study of the Finnish Lutheran hymnbook included also the new hymns that were introduced in the year 2016, so through my research I was also able to investigate how the Lutheran view of Mary is evolving in the present time. Likewise, the Finnish Catholic songbook Cantemus was published in the year 2012, so as my source it was also able to offer a fresh and contemporary look at the Catholic hymnody. While conducting my study, I had to return to the roots of Lutheranism that go back five centuries, to Martin Luther himself. In my personal opinion, Luther’s views of Mary, his idea of her as the model Christian who submits to God’s will, have greatly been lost during these five hundred years. While Luther condemned some aspects of the Catholic Mariology, he would still view her as a remarkable saint who prays for Christians. Interestingly, during the Finnish reformation, the image of Mary as a saint was lost gradually during the 16th Century. While the great Finnish figure of reformation Mikael Agricola promoted Mary in his early writings, later on he started being more and more critical towards her cult. While in contemporary Lutheranism the role of Mary is to be the virgin mother of Jesus, in my study I discovered that the Finnish Lutheran hymnbook Virsikirja does not limit its view of Mary to this. Naturally the portrayals of Mary as a mother and a virgin were indeed the most prominent, but on the other hand several hymns would also present her as the “handmaiden of the Lord”, an aspect of Mary that Luther emphasised in his Mariology. Furthermore, I noticed that the Lutheran hymns favoured the image of Mary as someone who is lowly and ordinary. This would match the Lutheran view of grace manifesting itself in things that do not deserve it. Despite the fact that the Catholic hymnbook Cantemus would hardly deny the view presented by Virsikirja, the Catholic hymns portray Mary as a somehow different kind of figure than the humble, mundane Mary of Lutherans. The Mary in the hymns of Cantemus is a powerful helper of the Christians and the Queen of Heaven, whose prayers have the power to shield believers from the upcoming judgement. In these texts, we are not invited to look at her as one of us, but more like the most powerful saint whose help and motherly mercy is always available. The difference between these depictions might seem rather contrasting on the first glance, and it is indeed true that there are many points on Virgin Mary where Lutherans and Catholics disagree. While Luther emphasised the poor, miserable girl that was to become the mother of God, Catholic tradition often depicts Mary showing saintly qualities even in her childhood, her exceptionality culminating in the dogma of the Immaculate Conception, which refers to Mary being free of sin. Ole tervehditty täällä, oi Maria! Ole siunattu maan päällä, oi Maria! [Be hailed here, o Mary! Be blessed on earth, o Mary! While the Finnish Lutheran text obviously omits the Catholic idea of Mary as a queen of Heaven, the passage features an interesting reference to different angels, which connect her to the heavenly beings, rather than mundane humans. Furthermore, the notions of Mary as hailed and blessed echo the words of the Marian prayer Hail Mary, which are again taken from the Gospel of Luke. This said, the hymn manages introduce a more “Catholic” image of Mary to Lutheran hymnody while simultaneously adhering to the biblical roots deeply valued in the Lutheran tradition. I cannot deny the fact that mostly the findings in my Master’s thesis simply demonstrate the differences between Lutheran and Catholic faith. However, seeing that the interest in many aspects of Mary’s character have been rekindled among Finnish Lutherans creates hope of mutual understanding and appreciation for this woman of many faces. This entry was posted in Yleinen on 2.12.2017 by Sara A Jormakka. November and December are dark times in the North. During the Finnish kaamos, the dark winter period, we only have few hours of daylight. Night closes in earlier and earlier, and we do what we can to keep the gloominess away. Taking into account the seemingly endless hours of darkness, it is easy to understand why light and lighting are such central elements in the Finnish Christmas preparations. By the end of November, candles, lanterns and Christmas lights in all colours and shapes turn up everywhere. Artificial lighting cannot compensate for the lack of natural light, but it does brighten up the darkness a bit. Christmas lightings remind us that eventually, days will grow longer again. Symbolically, in a Christian context, the approaching light is associated with the advent of Christ. In a way, the habit of lighting Christmas lightings can be seen as a way to reenact the prophecy about the people who walk in darkness and the light that shall shine upon them (Isaiah 9:2). As I come across a Christmas hymn in a hand-written hymnal from the 1780s in the Literary archives of the Finnish Literature Society, I find myself thinking about Christmas times in the 1780s compared to the present days. If the darkness seems overwhelming for us, despite of all the street lights and led lights and the big and small gleaming screens we constantly keep peering at, how dark has the darkness been for people living before the invention of electric light? 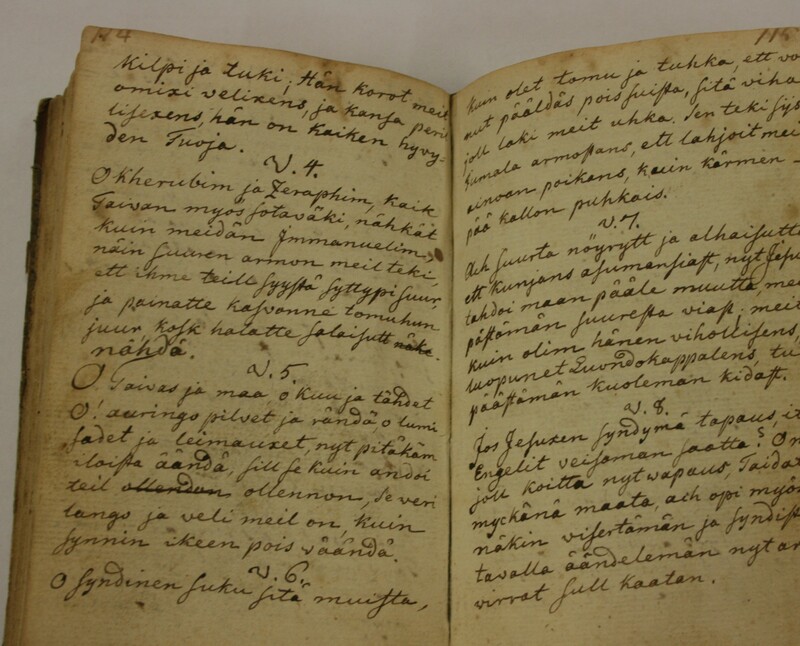 The small hymn book has presumably been compiled and used by pietists in the Southern Finnish town of Orimattila, but much of its history remains to be unearthed. Many of the hymns, meticulously written down in small but readable handwriting, are not well known: some were never printed and are nowadays completely forgotten. The only Christmas hymn in the book is written by Gustaf Lilius – his name, Gus. Lilius, can be found at the bottom of the page – but of this person nothing is known. Who was he, and did he have a personal connection with the pietists in Orimattila? How did his hymn end up in the manuscript? Was it sung to lighten up the long dark nights before Christmas, and if so, by whom? For the speaker of the poem, the birth of Christ seems to bring the world into a state of transformation. Instead of the normal winter weather with rain, sleet or snow, the hymn describes how the “righteous sun” shines (“Vanhurskas auring nyt paistapi”) and how the heaven is dripping grace (“taivas armoa tiukupi”) as people in the “Finnish marchlands” (“Suomen saaren soilla”) come together to celebrate Christmas. 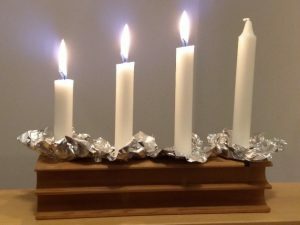 The linkage of light to hope and gladness is not only typical for Christmas hymns or even hymns in general, the symbolic meaning is more universal. Perhaps a more genre specific motif, also found in Gustaf Lilius’ hymn, is singing. Motifs connected to singing and music are frequently used to represent joy and gratitude, and hymns describing or expressing praise and adoration very often explicitly refer to the actual act of singing hymns. A central element in Lilius’ Christmas hymn is the exhortation to join in the singing. Here, the speaker refers to the heavenly host that praises God with their Glory to God in the highest, and on earth peace, good will toward men (Luke 2:14). Even if it is not stated that the praise of the angels is a song, the gloria is usually perceived as one. In this hymn, the song of the angels is set forth as an example for the world to follow. When the birth of Jesus makes even the angels sing, says the speaker, then how can the world, liberated from the pains of death, be silent? nyt armon virrat sull kaatan. Here, the ‘world’ is being addressed as ‘you’, and the speaker proposes that the world should learn to ‘twitter like the sinners’. The twittering draws parallels between humans and birds suggesting that people should express their joy in singing. Moreover, with the chirping and trilling of birds, the sound world of spring as well as the growing light that inspires birds to sing, enters the hymn. The contrast between the quiet and dusky winter landscape and the animate sounds and colours of spring is further enhanced, when the speaker urges other natural beings to join the chorus. kuin synnin ikeen pois väändä. (For us, the high King of heaven/ by a young pure virgin/ was born as man. The difference here compared to the Christmas hymn in the Orimattila manuscript has to do with manner of representation. Maskulainen’s hymn describes to us how the moon, the air, the sun, the earth, the sea, the stars and heavens serve the Lord. In Lilius’ hymn, the elements are being directly addressed: the heaven and earth, the moon and the sun are the ones being spoken to: “O Heaven and earth, o moon and stars/ O! Sun, clouds and sleet” (“O Taivas ja maa, o kuu ja tähdet, O! auringo pilvet ja rändä”). This apostrophic gesture – the act of addressing someone or something that is not present, like the sun and the moon – is ritualistic, performative and distinctively poetical, according to Jonathan Culler (2015, 213). Culler writes that the “function of apostrophe would be to posit a potentially responsive or at least attentive universe, to which one has a relation.” (Culler 2015, 216). The addressing of cherubs and seraphs or stars, snowfall and lightning means that they are represented as beings the speaker can communicate with. The apostrophe personifies them into creatures that hear, listen, and possibly respond by doing what the speaker of the poem asks them to do: to make “joyous noises” (“iloista äändä”). Thus, the act of apostrophizing endows the speaker with almost shamanistic powers. Like Orpheus or Väinämöinen he makes the natural forces and the heavenly creatures as well as the earthly ones stay and listen to himself. But unlike these mythical singers, whose music quietens down all living beings, the speaker in Lilius’ Christmas hymn makes the entire creation sing together with him to celebrate the birth of Christ. As a genre of religious poetry as well as a genre of congregational singing, the hymn seems to offer a suitable format for the staging of this joyous singalong of cosmic proportions. And so, with the help of the poetic power of the apostrophe, the silent, dark Finnish midwinter suddenly brakes into luminous song. 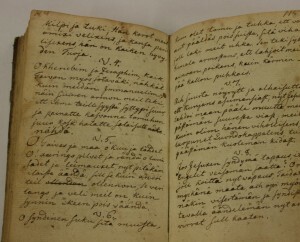 Gustaf Lilius’ Christmas hymn in the Orimattila Manuscript (A1663), a handwritten hymn book, in the Literary Archives of the Finnish Literature Society. Culler, Jonathan 2015: Theory of the Lyric. Cambridge, Massachusetts: Harvard University Press. Väinölä, Tauno 1995: Vanha Virsikirja. Vuoden 1701 suomalainen virsikirja. Tauno Väinölä. Helsinki: Kirjaneliö. This entry was posted in Yleinen on 2.12.2015 by Sara A Jormakka. It has been a year since the international conference on hymnology, Hymn – Song – Society, in the beautiful milieu of Hanasaari, Espoo. I can still remember the breathtaking musical experiences, presentations that widened my thinking, several interesting and inspiring discussions and the spirit of the conference, so nice and hearty. The conference has been on my mind recently also because I have been revising my article Young adults and spiritually experienced music that bases on my conference presentation and my future doctoral thesis in religious education, The meaning of Christian and spiritually experienced music on young adults’ religious learning trajectories and spiritual growth. In my article I study the music that the ten young adults that I interviewed had experienced as spiritual. Their background was in the Evangelical Lutheran Church but some of them had left the church, as it seems to be trendy among many young adults in Finland nowadays. Some of them had Christian faith, but some of them preferred certain ideologies or philosophies instead. Often those with Christian faith and spirituality could experience the Christian music as spiritual. Most of them could also experience that some secular music, for example popular music pieces on the radio or some instrumentals, support their Christian spirituality. The lyrics were used as a prayer or interpreted as a message from God or the music could create a feeling of a sacred space whenever listened to. On the other hand, a Christian hymn could be experienced as “touch of god” even though no god existed in the person’s belief system. Music as a form of art leaves room for interpretation and dialogue and it speaks the language of emotions. And then there is something mysterious in it as well. When I’m writing my doctoral thesis I often listen to music from contemporary Christian music to jazz and pompous movie soundtracks. A few times I have found some instrumental music on Youtube. That music was supposed to help in concentrating on studying, for example Relaxing Instrumental Music by Michael Fesser, alias relaxdaily, from Germany (relaxdaily.net). Also sometimes, instead of reading the background theories for my thesis, I have found myself reading the experiences that people have written for example about relaxdaily’s music. This actually seemed to become my sub-study for a while. The particular music is not created for religious contexts or environments of use and yet it still seems to influence the listeners not only in a relaxing way or by improving their study or work results, but in a spiritual way as well. This music gives me the feeling that one day, after I die, I will see my family members again in Heaven and ultimately embrace Christ. Thank you, Michael. I am looking for a background music while I am reading the Holy Bible. And I find your music. Great thanks. God loves you. God loves us all. I tried to listen to other relaxîg music here on youtube. I always come back straight to your music that has something special to connect to my spirit. Uou do an immense job. You are gifted!!! This is Talent! you are such a “faucet” to the world Michael! I never get tired of your music…and I have written some pretty awesome worship lyrics to the tunes because that’s just what it does for me…takes me into a place of Godly serenity! Thank you! Thank you Michael. After listening to many genres of music past 30 years, your music has become my favorite of all time. Thank you for sharing. May Lord Krishna bless you. These comments, as well as my own study, made me think about the divine essence of music. How can we actually experience the sacred in music and what kind of sacred it is that we experience? What is it that makes the music spiritual, especially in the case of this kind of instrumental music without any religious context or connections? Martin Luther said that music is a gift from God. Is it so that all music has a divine origin? I quote one of my informants who expressed her thoughts in this way: “Almost each human being has a spiritual side and then another side so that if you make music about your life, you will certainly make a few spiritual songs as well. If you reflect your own life in the music, you can’t help including the spirituality in some way” (Enni). If this is true, then does the same apply when music is listened to, sung or played? It is both confusing and amazing that people who probably come from different cultures and religious backgrounds seem to experience the same music as spiritual. Whether a person was doing yoga or reading the Bible, the same music could be played in the background. It could raise a person’s thoughts to Christ as well as to Krishna. Could it be that the music creates a space for dialogue and understanding between people with different religious backgrounds and from different cultures on the level of experiences? Could people share the experience of the presence of sacred even though the substance of religion would cause contradictions on the level of cognitive understanding? Throughout the history of Christianity there have been several debates about what kind of music is appropriate in the church context and what kind of music is “good” Christian music. The tradition of church music has been formed over time through negotiations and generations after generations have brought in new aspects and influences from the surrounding culture. Nowadays also secular music has perhaps become one way to search for the sacred and negotiate about the existential questions that the church perhaps hasn’t been able to give the young adults an adequate answer to (see for example Religion and Popular Music in Europe: New Expressions of Sacred and Secular Identity. Ed. Kahn-Harris et al. 2011). Isn’t it so that Jesus said “… if these should keep silent, the stones would immediately cry out” (Luke 19:40). He didn’t mean the Rolling Stones, did he? Yet in the transformation of religiousness music can be one medium to create the bridge to the sacred. 42:00–52:00. I was writing a document paper on religion vs. spirituality and this part of the track gave me life!!! I wish my Prof. could listen while he grades my paper! I believe my grade would be supernatural!!! 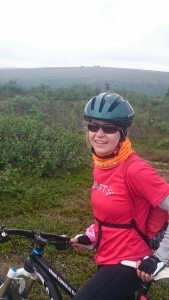 This entry was posted in Yleinen on 1.10.2015 by Sara A Jormakka. The Helsinki Forum for Research of Sacred Songs and Hymnology affords a digital forum for scholars actively researching hymns and other songs connected to religious approach or spirituality. To be the ‘Helsinki’ forum is only to tell we are moderating the forum in Helsinki, Finland, using facilities of the University of Helsinki. We welcome you to follow the forum whether you are living in Finland, other Nordic or European countries, or anywhere else in the world! Communal singing is an integral part of religious life. It combines the physical and the personal as an outlet for the emotions. The text of religious songs usually reflects doctrine or ideology. Corporate singing builds up the community and enables the enacting of the rituals. It fosters memories and continuity, and provides a diversity of structure. Hymns and songs resonate in people’s personal lives, in religious communities, and in wider society. Here are some facts about the background of the academic research project of hymns and spiritual songs conducted in Finland during the years 2010–2014. The multidisciplinary Finnish project cooperated with the Nordic Hymnological Research Network (NordHymn), especially when organising the international hymnological conference in Espoo, Finland, in October 2014. The existing need to combine the academic studies and networks in Finland with the international areas of researching sacred songs and hymns was discovered in the Espoo Conference and later on. It was also noticed for instance during The International Hymn Conference Cambridge 2015 where the Finnish project and some results of it were introduced. This entry was posted in Yleinen on 25.6.2015 by Pekka A Rautio.